Glenn Beck is a flatterer. If you watch his show on Fox News, there's a good chance you'll be told how intelligent and perceptive you are. On September 29, during a rant on how the (non-Fox) media "think that you are too stupid to figure it out," Beck told his viewers: "I'll treat you like an adult. Fox treats you like an adult. Bill O'Reilly treats you like an adult. They'll treat you like boys and girls." It's a classic salesman's gimmick. "Hey, I can tell you're a smart guy and I'm not going to waste your time, but this extended warranty is really worth the money." The earnest Beck fan who feels confident that the Fox News host respects his or her mental faculties might be a touch confused by Beck's latest book, Broke, which purports to grapple with the complexities of national debt but looks a lot like a fifth-grade history textbook, albeit with more references to the Bible and the flat tax. Broke features the author comically mugging on the cover; glossy pages with huge margins; and chapters stuffed with silly cartoons, countless diagrams, and non-sequitur insets labeled "A.D.D. Moments." It caters to the easily-distracted reader, constantly giving them something to focus on. It's the same formula Beck utilized in his last book, Arguing with Idiots, right down to the comic mugging and "A.D.D. Moments." The tone, however, is more staid than the typical Beck book. Sure, the childish insults, hackneyed jokes, and ham-fisted cultural references are there, but he also drones on for pages at a time about the statutory debt limit and public vs. intragovernmental obligations. Those seemingly interminable passages are sandwiched between a long-form retelling of American History Beck and Beck's plan for saving the country, pithily dubbed "The Plan." Let's deal with the history first. In some instances, Beck actually does attempt to grapple with the historical record. His treatment of the Reagan administration makes no effort to hide the fact that Ronald Reagan was a profligate spender who ran up huge deficits. But while the rest of the book traffics in anti-debt hysterics, Beck attempts to spin Reagan's debt-building as necessary, perhaps even salutary: "It financed the Cold War military buildup that helped free the world from communism." No such rationalizations are offered for Woodrow Wilson's or Franklin Roosevelt's social spending. Beck's pages-long attack on the economics of Social Security carefully ignores the fact that the program reduced the poverty rate among seniors by about 70 percent. For Beck, spending on the military is acceptable, but spending on the social safety net is Bolshevism. It's not surprising, then, that Beck's treatment of the nation's financial health also relies on absurd revisionism and talking points. On page 133 he attacks President Obama by writing "there are no pro-growth or pro-business tax cuts in his agenda," even though the stimulus bill contained a whole raft of business tax cuts. He lionizes the "thrifty" Founding Fathers without bothering to mention the War of 1812, which was funded almost entirely with borrowed money. The rest is essentially limited-government orthodoxy regurgitated from conservative and libertarian think tanks. Beck's chapter on "The Truth" contains eight charts from either the Heritage Foundation or the Cato Institute (Heritage pops up time and again throughout the book -- indeed, it starts to feel like every other citation is for Heritage budget analyst Brian Riedl). Then there's "The Plan." The latter third of Beck's book is devoted to his scheme to save America which, by his own admission, eschews the "bottom up" approach of "detailed policy papers and briefing books." 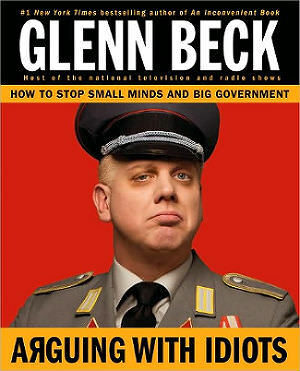 Instead, Beck opts for an Ayn Rand-inspired "top down" solution that he says will alter the way the entire country thinks. All that is required, writes Beck, is to "change the debate from one about rich vs. poor and Republicans vs. Democrats to one about freedom vs. serfdom and God vs. government." Beck's method for changing the mindset of an entire country is based largely on interpreting the Constitution to mean that the federal government can do little beyond fighting wars and issuing patents. This is to the exclusion (obviously) of all the progressive governmental reforms that have a proven track record of improving the lives of Americans, including the Pure Food and Drug Act -- "Should the government be able to deny a prescription drug to sufferers of a disease because it is not 'FDA approved'?" One might also ask if it should be able to deny a meat packer the right sell ground beef just because of a little E. coli. As for his specific prescriptions, Beck announces "I really don't like the idea of tinkering with our Constitution," and then proposes three Constitutional amendments to save the country, including one establishing term-limits, an idea so meritorious that the Founding Fathers left it on the cutting room floor. Other facets of the plan include eliminating Cabinet departments that have comparatively miniscule budgets, privatizing pretty much everything else, and lots and lots of prayer: "If you believe, as I do, that the Founders' work in creating this nation was divinely inspired, then you should also believe that God is not going to look kindly at the dismantling of what He created." Broke is exactly what you'd expect from a Glenn Beck production: the "real" history of America, libertarians good, progressives bad, and prayer, all of it rendered easily digestible. It's the Beck formula, slightly rejiggered to scam a few extra bucks from the people who hear essentially the same message on his TV and radio programs. Broke's success will be a product both of Beck's brand and the extent to which he's conditioned his audience to fear debt as much as George Soros or Van Jones or the Tides Foundation or any other of his boogeymen of the week. But you're all smart people, you didn't need me to tell you that.